The Huskie Athletic Fund provides you with the opportunity to designate your contribution to the area of your choice. Gifts to the unrestricted fund go to support vital areas of need within the NIU Athletics program. 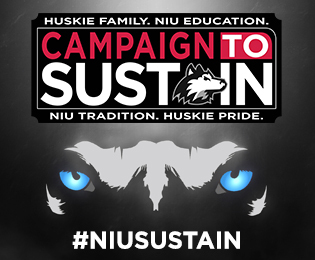 We encourage gifts to be designated to the Student-Athlete Excellence Fund (formerly called the Unrestricted Fund), which is vital to NIU Athletics sustainability. Contributions to NIU Athletics may be allocated to the sport of your choice. Support any of the 17 NIU Athletics sports programs. Enjoy NIU Athletics events from the best seats in the house. Premium seating and hospitality offers fans the opportunity to enhance their game day experience for football and men’s basketball. Donated services or items (e.g. food and beverage, athletic equipment, printing, air travel, etc.) that would normally be purchased by the NIU Athletic Department are considered gift-in-kind and are always appreciated. Subject to University approval and IRS regulations, the value of the contribution would be credited to your account. Endowments generate earnings, and the principal is invested for the long term, sustaining NIU Athletics throughout even the most uncertain times. You can direct your gift to support a particular interest or to be used where the need is greatest. Through thoughtful estate planning, you can ensure that the important people and favorite causes in your life receive what you intend after you’re gone. The tools and resources the NIU Foundation can provide you will help you learn more about preparing an effective estate plan and planning a gift to NIU. Please call the NIU Office of Planned Giving at (815) 753-1344 for more information regarding your legacy at NIU. NIU Athletics and the Huskie Athletic Fund have various events throughout the year. Depending on the event, proceeds may go to support a specific sport or program area.